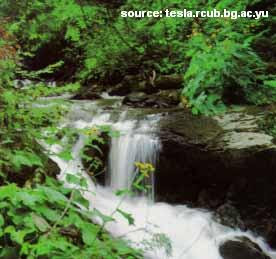 National park Kopaonik is located in central Serbia, 230km from the capital Belgrade. It is accessible from two corridors - Josanicke Banje and Brisa. Although its one of the biggest nation parks, it doesn't cover the whole Kopaonik mountain; its situated on a flat region, a plateau caller Suvo Rudiste, and is surrounded by mountain peaks. These zones are classified as ''special interest'' areas, because of the animal and plant species that live there, and are intentionally isolated and additionally protected (I'm not sure does this mean that they are no-go areas for tourist). Local laws, as well as a number of different international conventions regulate the park. Of all the wildlife species that are living in the park, its variety of birds is probably most famous; those include scops owl, rock partridge and red-backed shrike. Bigger species of mammals like wolfs and bears are a rarity. I have never visited Kopaonik National Park, but I have traveled to Kopaonik Mountain - the landscape is beautiful and often simply stunning. I can only imagine what the park looks like, but I can bet it's even more picturesque, due to it's protected status. If you're into bird watching or are interested or love untouched mountain scenery, Kopaonik National park is the perfect place for a one-day visit.